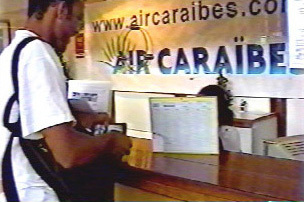 The airport in Martinique offers all the amenities of the traditional international airport: restaurants, duty-free shops, money exchanges, tobacco and newspaper stands. One should plan to arrive at the airport between two and three hours before flight departure time. When traveling to the airport, most people take a taxi or have a family member or friend drop them off. Buses do not run there, but the hotels have shuttles. Taxicos, which are mini-vans that take up to ten passengers, sometimes travel routes that include the airport as a destination.